Stylesheets are designed for a low memory footprint, fast startup, and fast operation. Most everything is done at compile-time, as it's all just ruby code. Low magic. They are called styles and stylesheets, but they are used for layout also. Basically if it changes the way a user sees something, it belongs in a stylesheet. 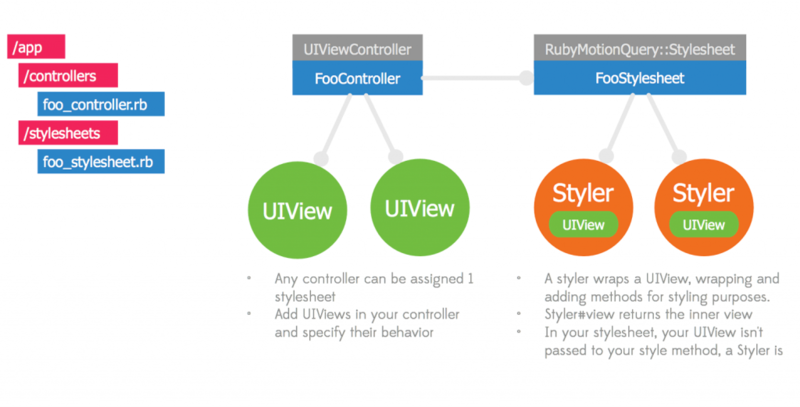 Lots of methods exist for adding/building/adjusting views add styles. You can apply a style in multiple locations. If a view has multiple styles applied to it and then you make some modifications to your view or screen, you can then call reapply_styles selected view(s) so that all styles will be reapplied again in the correct order from one simple method. "Write once, reapply anytime!" Most commonly used when new items are dynamically loaded, or if width/height of a view are changed (like on rotation). You'll probably want an application-wide stylesheet. Simple create one, and then inherit it in all your stylesheets. This stylesheet uses normal rect layout (left, right, etc). It could also be done using the grid. I purposely used a variety of different things in this stylesheet to show different examples. In real life, I personally would use fr:, not from_right:. Both are fine, but I'd be consistent. # Add stylesheet specific setup stuff here. st.text = "Animate move and scale"
st.frame = if landscape? && iphone? st.text = "This is a Popup, woot!"